Throughout the year Autism Speaks hosts ‘Walk Now For Autism’ events across the country. The Minnesota event is set for this Saturday, September 25th at Canterbury Park in Shakopee. I recently did an interview for my television program about the walk. If you’d like more information about the walk, check out the official website. There’s a good chance you’ve already heard about the movie about Temple Grandin, aptly titled….”Temple Grandin.” It premiered in February on HBO & just recently won a bunch of Emmy’s including a Best Actress statuette for Claire Danes’ portrayal of Grandin. Grandin was diagnosed with autism at a time when not as much was known about the disorder. Her Mother was advised by a doctor to put her in an institution. Her Mother refused to give up on her & Grandin eventually flourished to the point where she earned her Doctorate and is a world-renowned animal researcher. I had wanted to see the movie when it premiered but we unfortunately don’t get HBO in our home. It recently was released on DVD & my wife and I just watched it. It was excellent! It is so inspiring! Whether you’d like to learn more about autism or are just a fan of well-made movies, then I think you need to watch it. I’m also excited that Temple is coming to a college in my area next month to speak. We’ll definitely be in the crowd! Here’s the trailer for the movie….. So I guess it’s been a while…. Well, look who’s back! I have really been a horrible blogger in 2010! I had purposed to write more often this year and I haven’t done a very good job at that. Just life getting in the way I guess. I’ll try to do a more proper post soon, but here’s just a little bit of what’s been going on lately. We recently did hyperbaric oxygen therapy with our son. We did 40 ‘dives’ in the chamber. Our hope was to see an increase in speech. So far, there really hasn’t been more speech, but we’ve noticed quite a few other positive changes. Our son seems to be a little bit more aware, his eye contact has been much improved, he’s laughing more, and he’s even been ‘teasing’ us quite a bit too. I really get excited when he ‘teases’ us. That means his mind is grasping some things he wasn’t before. For instance, the other day I was playing with him in our backyard. He loves to use his swing set and had been swinging for quite a long time. He stopped and I gave him the option of another push and more swinging, or we could go inside and get something to eat. He got off the swing and ran over to the fence. I assumed this meant we were going inside. As I got close to the fence, he started laughing and dashed off back to the swing. He did this a few more times. He really kept looking for my reaction. It was a lot of fun and I felt like we were playing our own little game together. I really treasure those kinds of moments. So even if we didn’t get the speech yet that we were hoping for, it was definitely worth the time and money for us to do the hyperbarics if we’re getting more glimpses of our little guy’s personality. 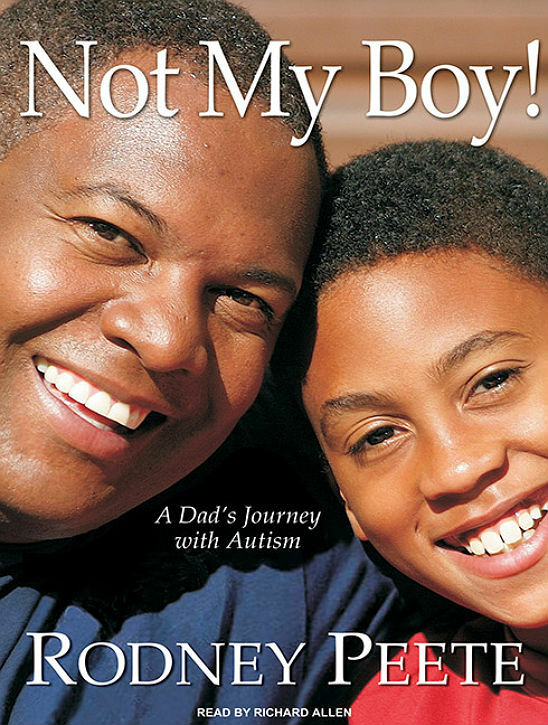 I also just finished reading “Not My Boy!” by Rodney Peete. He’s a retired NFL Quarterback who along with his wife, actress Holly Robinson Peete, has a young son with autism. I really enjoyed the book. It’s geared towards fathers. I really wish this book would have been out when we were first trying to learn about autism. Most of the books out there are geared towards mothers and are written by mothers. Those books are great too, but Peete was able to relay things from a man’s perspective. I would highly recommend reading this book if you’re a dad out there who has a kid on the autism spectrum. Even if you already know a lot of the stuff he’s talking about, I think you’ll still feel re-energized to fight for your child after reading the book. I had an eye-opening experience this past weekend. The church my family attends, Eagle Brook Church, has been doing a series about social justice issues. We’ve been learning about why it’s important to take notice of those who need help not only in our own cities, but also across the world. For 10 days, we were given the chance to volunteer for a Twin Cities non-profit called Feed My Starving Children. They are a hunger relief organization that provides food to over 60 countries. They host what they call ‘mobile pack’ events where volunteers help to pack their meals. Throughout the course of 10 days, over 11-thousand volunteers from our church and our community came out to pack meals. I was fortunate enough to volunteer this past Saturday morning and it certainly was an amazing experience. I believe I’ve always had a compassionate heart, but I can’t say I really know what it’s like to be truly hungry. Sure I might miss lunch by an hour or forget to eat breakfast, but that kind of hunger can easily be remedied. I can eat anytime, anyplace I want to. My biggest problem with food isn’t that I can’t get access to it…rather that since I can eat anything, I often eat too much. It’s hard for me to imagine that there are people who don’t have access to food and will literally starve to death. Before the event someone told me that the cool thing about volunteering for Feed My Starving Children, is that short of visiting one of these countries where the meals are sent..this is about as hands on as you can get. We were the last ones touching these bags. The next person to open this bag of food will be the mother of a starving child or someone who runs an orphanage. During the hour and a half shift, my back really started to hurt. But before I could feel too sorry for myself, I had to give thanks for the many blessings I have. Surely an hour and a half of minor back discomfort is nothing compared to worrying about where your next meal will come from. What does all of this have to do with autism? Not much, I suppose. From time to time I think I’ll write about things on this blog that aren’t necessarily autism-related. Perhaps that way I’ll actually post more! Plus, I guess it shows that autism hasn’t totally defined my family’s world and that we’re capable to seeing other things going on too. I will say though that we often worry about my son’s diet. He’s on the GF/CF diet that so many kids with autism are on. He’s a very picky eater. Even though he mainly survives on chicken, mashed potatoes, and lately lots and lots of pudding, we have no problems having access to food and having the means to purchase it for him. For that I am very grateful. I just pray that somehow the rest of the world will be able to have a good, nutritious meal every day. Here’s a video our church produced to promote the Feed My Starving Children event. It’s pretty short and should give you an even better idea of the program than my ramblings have. I’m also working on a story about the event for the tv station I work at. I’ll try to post that later this week when it’s done. If you’d like to learn even more about Feed My Starving Children, visit their website here. So I know I posted about this a few days ago, but today is the last day you can vote for the National Autism Association to win one of the $1-million prizes being given away through Chase Community Giving. 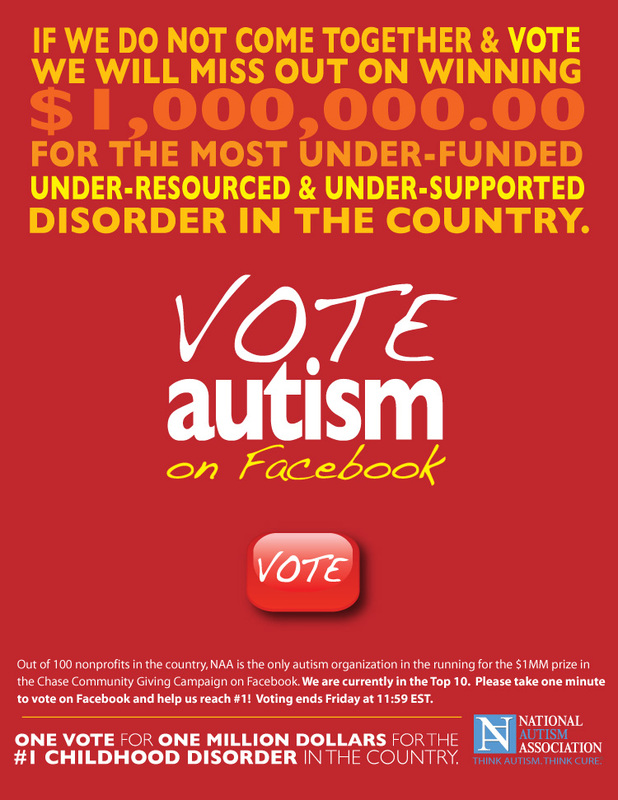 There are 100 charities that people can vote on and the NAA is the only autism-related one. The top 5 vote getters will receive a $1-million prize. Just think how many families the NAA could help and what kind of resources they could provide with that kind of money. I’ve been impressed to see how many other autism organizations are throwing their support behind the NAA to win this. Usually it doesn’t seem like all these autism organizations get along too well, but this seems to be one instance where they’re all helping each other out. So if you have a Facebook account, it only takes a few seconds to cast your vote here. And if you don’t use Facebook…what are you waiting for? Everybody else is on it. Just think…you can reconnect with family & friends and cast your vote!!! Here’s the info that the NAA just sent out about this. Again, just go here and you’ll be able to cast your vote!!!! There’s a contest going on now on Facebook where you can vote for a charity to receive $1-million. The only autism related charity is the National Autism Association. Here’s the details that the NAA posted…. Last month your votes put the National Autism Association into Round 2 of Chase Community Giving – voting is now underway for $1,000,000! Autism is a national health emergency, now affecting 1 in 110 children in the US, yet resources for families remain scarce and under-funded. On a very modest budget, NAA’s programs provide REAL help and hope to families affected by Autism. One million dollars is not a drop in the bucket for our organization, it is a game-changer and will allow us to significantly expand our programs. NAA is the only autism organization in the running and we need your help! Please take a minute to cast your vote for NAA today. You can make a huge difference! – Request their support by adding a customized link to your page today – whether your a mom, a teacher, or Twilight Fan there’s one for you! Check them all out here:http://www.nationalautismassociation…. – Spread the hope anyway you can. So if you’re on Facebook, go ahead and vote! It only takes a minute and it could really help the lives of families of children with autism. My wife came across this great video recently of a 17 year old girl with autism. She is very articulate and explains what it’s been like to have autism. I’ve really been wondering a lot lately about what might be going on in the heads of these kids with autism. You hear so many stories of autistic kids having so much more in their heads than we give them credit for. We just assume that if there are communication difficulties, then the kids aren’t absorbing anything. But as you’ll learn from this video, these kids are picking up quite a bit. So if you’re a parent of a child with autism, this should give you some great hope and encouragement. Even if you have no immediate connection to autism and are just interested/curious about it, then check this out. My wife and I have always been big fans of the ‘True Life’ series on MTV. These hour-long documentaries have followed a wide variety of subjects including “I’m Going to Performing Arts Camp,” “I Have Embarrassing Parents,” and “I’m a Jersey Shore Girl.” You name it, they’ve probably covered it by now. In 2007, they did a show called “I Have Autism.” They follow 3 different young men with autism. One is pretty severe and is learning to use an assistive device to communicate. Another is very talented at art, but is having problems with meltdowns. And another young man has Asperger’s and is trying to launch a stand-up comedy career. I’ve been wanting to see this for a while. I must have missed it when it first aired and even though MTV airs these things all the time, I’ve never caught a rerun. Now though, you can watch a ton of the full “True Life” episodes on MTV’s website for free. I finally got around to watching “I Have Autism” and I thought it was very interesting. It probably would have been very hard for me to watch when we were first dealing with our son’s diagnosis, but 2 years into this for me, and it’s not as hard. I can look past some of the challenges these families are facing and instead share joy with their triumphs. Plus, our son is 4 and it doesn’t do me a whole lot of good right now to project what his life will be like when he’s in his late teens like the guys who are featured in this show. So if you’ve got a little under an hour to spare, it’s worth a watch. You’ll laugh at times, and I think you’ll cry at times, especially for the young man who is so excited to plan his first ever birthday party with friends. I can never seem to figure out how to embed videos here if they’re not on YouTube, so if you want to watch MTV’s True Life: “I Have Autism” then go to this link. Has it really been almost 2 months since my last post? Trust me, I’ve had plenty of brilliant ideas floating around in my head of things to write about on here, but I never seem to actually get around to doing it. Perhaps in 2010 I will maintain some semblance of activity on here. I found that our story is fairly similar to this family’s story in the beginning. The reporter notes that not every child will respond as favorably as this one did to early intervention like ABA therapy, but I’m hopeful we’re on the road to the same success the Exkorn’s achieved. I’ve been trying in vain to embed the clip right here, but I’m not having much success. So just go here and you can watch it. My son and I have always gotten along well, but since this summer we’ve become quite the pals. There were days in the past I would so long for us to have a closer relationship. He went through the normal stages of being closer to Mommy and I was confused as to how to get closer to him. I think maybe for a while I used autism as an excuse for me to not try to enter his world as much as I should have. “I don’t know how to play with him!” I would say to my wife. “You just have to get in there and try,” she would say. But it always felt kind of like the whole chicken vs. egg debate. Was he not responding to me as much because I wasn’t playing with him a ton? Or was I not playing with him a ton because he didn’t respond to me? At some point I guess I made a conscious decision to just meet my little boy where he’s at. Instead of focusing so much on the things I thought he couldn’t do, why not pour my energies into the things he CAN do? What a novel concept! I felt like we as a family were placing so many demands on how he was supposed to act at all times. We couldn’t enjoy a leisurely trip to the park because he doesn’t play with the equipment there the way ‘typical’ kids do. Well, once I made the decision to enjoy the things he enjoys, we all had a lot more fun. Who sets the rules at the park? If he wants to swing for a half hour at a time and is enjoying it, why don’t I just lighten up and enjoy it too? Our relationship has just grown by leaps and bounds these last few months. I wake up every morning to hear him calling out “Daddy! Daddy!” If I happen to be at work late, he’ll keep calling my name until I come home. He’s always taking me by the hand to go off on an adventure in the house. I love that little boy so much and I’m so glad I made the decision to not be so uptight and to spend more of my energy having fun, playing, and encouraging him. Does this mean I’m not still striving to help him succeed in life? Hardly. But I think this approach is going to help him more in the long-run by letting him know I accept and love all his unique gifts and talents and will cheer him on regardless of what all the other kids out there are doing.